The Little Witch is a German/Swiss film that has been dubbed into English. 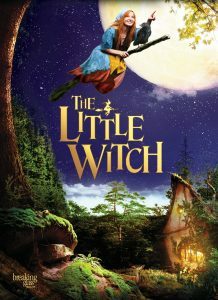 It’s the story of a young witch (127 years old) who desperately wants to attend the annual witch’s dance, however she is too young. When she sneaks into the dance and is discovered, her punishment is to learn everything in the witch’s book of spells and be the best witch by the next year. If she can do that then she will be able to attend the annual party. If she cannot do it, then her powers will be taken away. Along with her friend Abraxas, who happens to be a raven, she sets out to learn the entire book of spells and become a good witch. She is a kind-hearted girl and that doesn’t exactly come in handy when being tested by the older witches. But in the end it is her desire to do good that wins out and let’s just say that the other witches discover just how good a witch this little one has become. The movie was nominated for “Outstanding Children or Youth Film” by the German Film Festival. It’s a movie that kids will enjoy however because it is dubbed into English, adults will most likely not be enthralled by the movie. It is, at times, a charming tale and has an excellent score. The Little Witch is not rated, however it is a family friendly film. It runs 103 minutes.